Tonnage is up this year at the Port of Houston Authority, with container tonnage through May up by 9%, Executive Director Len Waterworth reported at Tuesday's meeting of the Port Commission of the Port of Houston Authority. Waterworth also reported that May operating revenue was at an all-time high of $20 million, up 4% or $800,000. This marked the first time in Port Authority history that operating revenue has exceeded $20 million. Year-to-date operating revenue of $96 million reflects a $4 million or 5% increase, again driven by strong container growth. Also in his monthly report, Waterworth said that total tonnage at Port Authority facilities for the month of May was 3 million tons, up 10% over the prior year, led by container growth at Barbours Cut, in particular. Year-to-date total tonnage of 15 million tons is up 3%. Container tonnage is up 10% in May and up 9% year to date, at 8 million tons. Waterworth said steel for the month of May is down 21% due primarily to declines in the drilling industry, which was at a peak in 2012. Year to date, steel is at 2 million tons. Bulk cargo (including grains and coal) is up by 37% at 1 million tons due in part to improved grain exports over the prior year. Year to date, bulk cargo is 4 million tons, up 14%. Year to date, the Port Authority has realized $21 million in net income, up $5 million or 34%, with higher contributions in aid of construction and grant funding receipts received thus far in the year. Total cash flow of $44 million is up by $6 million or 15% so far this year. Net operating income is ahead of budget by $9 million or 309%, due to strength in container revenues combined with lower spending. 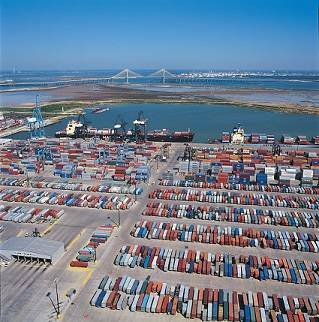 A budget reforecast will be submitted to the Port Commission in July. During the meeting, Chairman Janiece Longoria recognized the arrival earlier in the month of the Port Authority's first, new high-tech emergency response vessel. Its two-week journey across the country was highlighted through daily updates on Facebook and Twitter. This is the first of three state-of-the-art vessels, purchased with awards from the Department of Homeland Security and the Federal Emergency Management Agency Port Security Grant Program as well as matching funds from the Port Authority. Longoria reported that Marcus Woodring, Managing Director for Health, Safety, Security and Environmental, ably represented the Port Authority in his June 18 testimony before the U.S. House of Representatives Subcommittee on Border and Maritime Security regarding the Transportation Worker Identification Credential or TWIC program. The Port Authority participated at the invitation of Congresswoman Sheila Jackson Lee. The Port Authority's Safety Director was introduced at the meeting. Richard Galle will guide the overall safety program management throughout the organization. The opportunity to enhance the Port Authority's safety program was one outcome of the Sunset Advisory Commission recommendations. Longoria announced that Executive Director Len Waterworth was recently appointed to the U.S. Department of Transportation as a member of the new National Freight Advisory Committee, which is charged with providing advice and recommendations to help improve the national freight transportation system. Waterworth gave a brief update on the permitting process for Bayport and Barbours Cut channel dredging. He said that he was in communication with U.S. Army Corps of Engineers leadership and was confident that the construction award would occur early next year. Longoria also congratulated the first class of maritime graduates from the Port of Houston Maritime Academy programs at Jack Yates and Stephen F. Austin high schools in the Houston Independent School District. Collectively, 105 maritime students graduated this year, including those in programs at high schools in the LaPorte and Pasadena school districts. Woodring presented the first-ever PHA Fire Department Chief's Medal to Assistant Chief Jason Roberts in acknowledgement of his heroic efforts in saving a man's life. On May 31, Roberts was driving back to the PHA firehouse when he noticed a woman waving frantically. She had stopped to block traffic for a man who had been hit by a truck and was lying in the road. Roberts gave the man oxygen and stabilized him until Channelview EMS arrived and Life Flighted him to the hospital. Chief William Buck presented Roberts with the medal for his "unselfish response and professional medical care in saving the man's life," and noted that Roberts went above and beyond the call of duty in a situation that usually called for a three-man team. The full meeting agenda is available on the Port of Houston Authority website, www.portofhouston.com/the-port-commission/public-meetings/agendas.